The first pillar of a carbon dividends plan is a gradually rising fee on carbon dioxide emissions, to be implemented at the refinery or the first point where fossil fuels enter the economy, meaning the mine, well or port. Economists are nearly unanimous in their belief that a carbon fee is the most efficient and effective way to reduce carbon emissions. A sensible carbon fee should begin at $40 a ton and increase steadily over time, sending a powerful signal to businesses and consumers, while generating revenue to reward Americans for decreasing their carbon footprint. Border adjustments for the carbon content of both imports and exports would protect American competitiveness and punish free-riding by other nations, encouraging them to adopt carbon pricing of their own. Exports to countries without comparable carbon pricing systems would receive rebates for carbon fees paid, while imports from such countries would face fees on the carbon content of their products. Proceeds from such fees would benefit the American people in the form of larger carbon dividends or could be used for transitional assistance for industries or regions hurt by the carbon fee. Other trade remedies could also be used to encourage our trading partners to adopt comparable carbon pricing. The final pillar is the elimination of regulations that are no longer necessary upon the enactment of a rising carbon fee whose longevity is secured by the popularity of dividends. Many, though not all, of the Obama-era carbon dioxide regulations could be safely phased out, including an outright repeal of the Clean Power Plan. Robust carbon fees would also make possible protecting companies from federal and state tort liability for historic emissions. To build and sustain a bipartisan consensus for a regulatory simplification of this magnitude, however, the initial carbon fee rate should be set to significantly exceed the emissions reductions of all Obama-era climate regulations, and the carbon fee should increase from year to year. 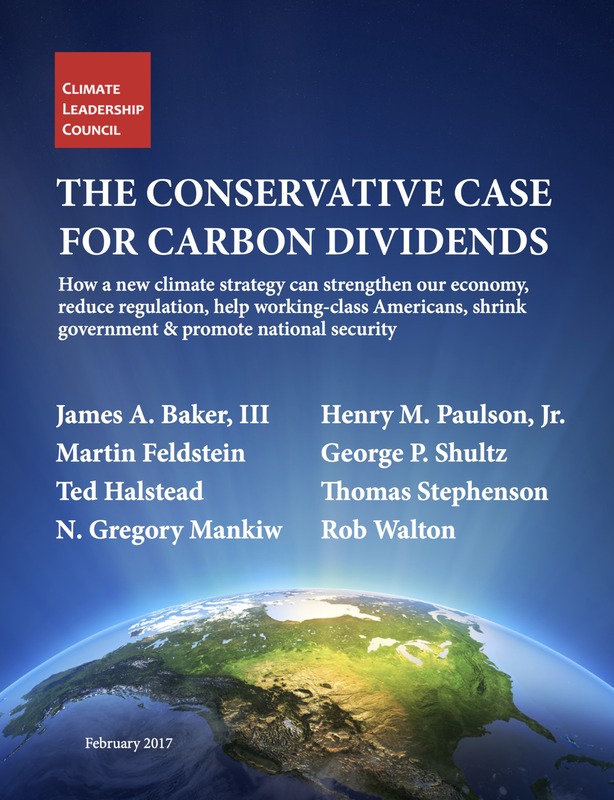 As an international research and advocacy organization, the Climate Leadership Council will adapt this carbon dividends framework to other leading greenhouse gas emitting countries and regions. With certain adjustments, the four-part framework outlined above offers a cost-effective, popular, and equitable climate solution for most major countries outside the United States. Each country, of course, will need to adapt this framework to fit its system of government and national circumstances. There may be, for example, significant differences in how the dividends are administered and in the appropriate level of regulatory simplification.